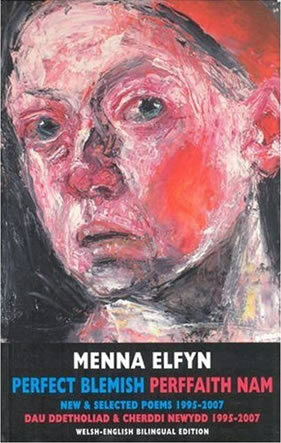 The bilingual edition of Menna Elfyn’s new book, Perfect Blemish Perffaith Nam, is a collection of contemplative, stimulating, visual and thought provoking international poetry which includes work from Cell Angel (1996) and Blind Man’s Kiss / Cusan Dyn Dall (2001). with emphemerality, the enigma of the rights of passage of womanhood, mankind’s inequality and inhumanity. stubborn in sacrifice, waiting for wings. who brought down snake-spit on his head. How do you milk 'whales'? whales and a calm sea. the sweet wrinkle of waves on their backs. overflowing and dripping like milk. Also the darker, Sea questionnaire: “ Does the maram grass when it is droopy feel more loopy when it feels the children’s hands buried in the sand dunes”. The work celebrates, in a very non-parochial way, the descriptive depth of the Welsh language when addressing universal concepts and contemporary international affairs. It draws on a font of culture and events as far back as the 6th century when responding to the bizarreness of daily revelations. The work is skilful, vibrant, brimming with life force and energy. The highly sympathetic translations offer not only a key of accessibility to the non Welsh speaker, they also demonstrate the specific and impersonal nature of the English words, opposed to the more stratified, encompassing, and personal nature of Welsh words. Possibly one of the best books of contemporary poetry there is, and has to be a must have for any reader of poetry. It is certainly one that you will read and re-read to unearth limitless gems of discovery.